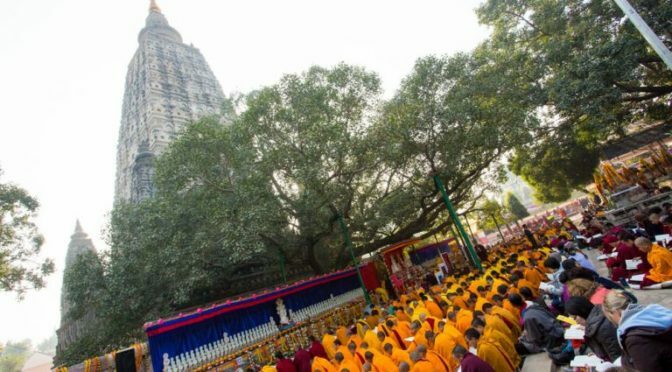 The 2016 Kagyu Monlam will take place from 15 December – 21 December in Bodh Gaya. The ceremonies will be led by Thaye Dorje, His Holiness the 17th Gyalwa Karmapa. 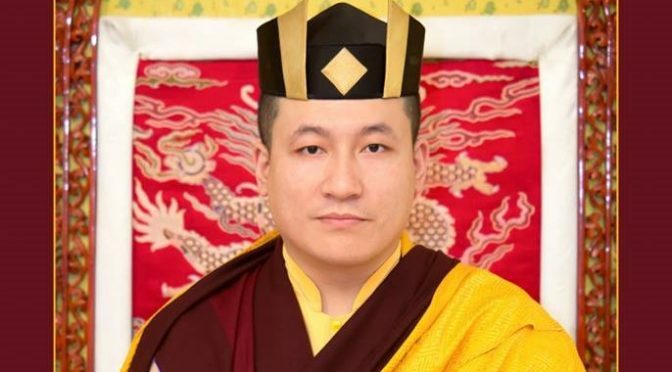 As the head of the Karma Kagyu lineage, Karmapa will preside over the ceremonies, assisted by other high lamas of the Karma Kagyu and other Kagyu schools. The Monlam is being organised by Karmapa’s charitable trust, the South Asia Buddhist Association (SABA). One of SABA’s main goals is to promote literacy and education to raise awareness of Inner Wealth, the inborn pure qualities of wisdom and compassion that every human being possesses. At Bodh Gaya, under the Bodhi Tree, descendent of the very tree under which the historical Buddha attained enlightenment, Karmapa will lead prayers, accompanied by lamas, monks, nuns and lay students from India and around the world. Samantabhadra’s King of Aspiration Prayers will be at the centre of these recitations. This traditional wishing prayer consists of vast altruistic aspirations to attain enlightenment in order to lead all beings to enlightenment. Aspirations are extremely powerful. They are one of the most moving phenomena, which touch us deeply. They go very much to the depth of our consciousness. Karmapa will grant an empowerment, and conduct a puja for the deceased. Jamgon Kongtrul Rinpoche will also give teachings. Thaye Dorje, His Holiness the 17th Gyalwa Karmapa, shares the following teaching on compassion, on the anniversary of His Holiness the 16th Gyalwa Karmapa’s paranirvana. This particular quote by the great Buddhist master Chandrakirti is a part of my daily prayers and practices, not just because I’m a Buddhist – but because I am a human being. The quote speaks to my consciousness, which allows me to recognize, understand, and accept that the saying ‘love conquers all’ is justified. In other words, these four lines are part of my daily practice because they are true. Why? Because, ultimately, what really matters, what is worthwhile, is genuine care. It is only through genuine care that we can find joy. ‘Genuine’ means unconditioned, and ‘joy’ means being free from all forms of anxiety and pain, which in Buddhist terms means being free from karma and klesha (afflictive emotions). In this ever-changing and brief, abrupt life, the only meaningful thing that we can achieve is compassion. Compassion is the only substantial thing we can leave behind for others, and it’s the only substantial thing that we can take with us. No matter how great the power, the financial fortune, the fame that we might amass, at the end of our life’s chapter, and on the journey from one life to another, compassion is the only gift that we can take with us and pass on to others. Compassion defies the logic and laws of life, transcending birth, ageing, illness and death. Compassion is the only quality that can help us understand these four stages of life not as something terrible but as truth, impermanence, and nature. Therefore, it helps us to find courage to live meaningful lives. Suddenly, through knowing and accepting the impermanence of life, we discover much more joy, much more purpose in life. Compassion gives birth to extraordinary beings, such as the Shravakas and Pratyekabuddhas. These are individuals just like ourselves, but who achieve the courage to let go of the source of life’s anxiety: the ego, which harms all sentient beings. Compassion also gives birth to other extraordinary beings, such as the Buddhas and bodhisattvas, who develop the courage to share the experience of compassion with all sentient beings – even though they know that there is no limit to the number of sentient beings. Therefore, should we wish to cherish anything in life, it should be none other than compassion. A compassion that is unconditioned, like a mother’s love for her only child. For her child’s sake, a mother is willing to sacrifice even her own life. What kind of person might this child might become in the future? Such a question is irrelevant when it comes to a mother’s love and compassion. May we see our human existence as a precious human existence, which will enable us to cherish qualities like this, not next year, not tomorrow but right here, right now.